While it may be less costly to catch fish and shrimp in the wild than farm, according to a 2018 report from the Food and Agricultural Organization of the United Nations (FAO), there is simply not enough wild seafood on the planet to meet global demand. In fact, half the seafood people eat in the world now comes from farms, growing to 62% by 2030, says a 2014 World Bank report. To help take growing pressure off of Ontario’s wild fish stocks, farmers have been growing sustainable seafood in the province’s waters for more than 60 years. Seafood farming is a way to feed more people with fewer resources. What species of seafood do we farm in Ontario? Currently we farm seven different species: rainbow trout, pacific white shrimp, tilapia, barramundi, perch and lake whitefish. See if you can guess which species is which below, and check your answers by scrolling down the About the Industry page! Where is seafood farmed in Ontario? Fish and shrimp is farmed all over Ontario, with the earliest farms dating back to 1953. Most rainbow trout is hatched on land-based facilities throughout the province, and then transported to open net-pens in Georgian Bay and the adjacent North Channel to grow to market size. Other species, such as shrimp, tilapia, and barramundi grow in land-based facilities throughout the province. Why is eating fish good for the environment? According to a team of researchers from Johns Hopkins University, fish are more efficient at converting protein than other animals. 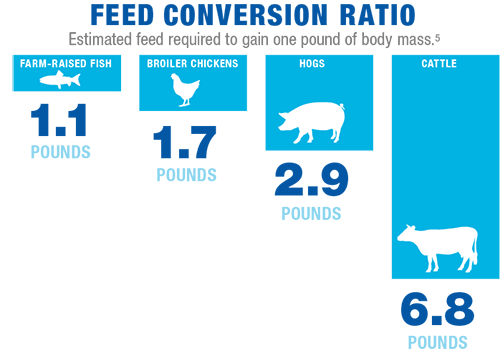 The chart below compares the feed-conversion ratios of farmed fish, poultry, and beef to illustrate that aquaculture is indeed the most efficient means of producing protein. Feed-conversion rate refers to an estimate of the feed required to gain one pound of body mass, and higher rates mean greater demands on resources such as water, fuel, fertilizers and pesticides. In terms of greenhouse gas emissions, other studies have shown that farming fish contributes less carbon emissions, phosphorous, and nitrogen into the environment compared to other animals. For example, an independent Life Cycle Assessment conducted in British Columbia in 2016 showed that farmed salmon contributed less carbon emissions and used less water than any other livestock species, and also contributed less phosphorous to the environment than beef (all per kilogram of meat). Do Ontario seafood farmers grow for human consumption or recreational stocking? The majority of seafood farmed in Ontario is destined for grocery stores and dinner plates in the province and exported abroad. The Government of Ontario operates nine fish culture stations where fish are bred to release for sport fishing and conservation. Why do you farm rainbow trout in Ontario? 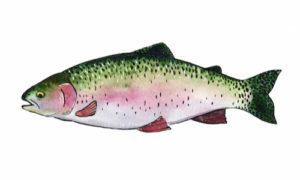 Rainbow trout are well suited to life in the Great Lakes watershed. They’re hardy, prefer colder freshwater, and are already naturalized to the environment, having been introduced into the Great Lakes in 1895. And they’re delicious! Rainbow trouts’ mild, delicate, and nut-like flavor goes well with lemon juice, garden herbs almonds, and butter. What’s the difference between a rainbow trout and a steelhead trout? They’re essentially the same fish (both oncorhynchus mykiss) with the fish described as the ‘steelhead trout’ often (but not always) a larger, longer-living ocean-going rainbow trout. While there are a number of variations of the rainbow trout, most of the common names are used primarily to distinguish them for marketing purposes. According to the Canadian Food Inspection Agency’s Fish List, rainbow trout can be labelled as ‘steelhead trout’, ‘deep sea trout’, and even ‘steelhead salmon’. Why is rainbow trout healthy? Rainbow trout are extremely high in Omega-3 fatty acids, which have all sorts of powerful health benefits for your body and brain. Omega-3 fatty acids have been shown to decrease inflammation, improve cognitive function, and increase heart and eye health. Health Canada recommends eat at least two servings of fish (5 oz) every week due to their health benefits, in part from Omega-3 fatty acids. The Government of Canada even recommends including more Omega-3 in your diet during pregnancy to support brain and tissue growth in the infant. What is a net pen? Net-pens are large, floating, and contained net structures that can range anywhere from 500 to 20,000 cubic metres. In Ontario, most net-pens are between 15 – 25 metres wide, and between 15 – 25 metres deep. They allow trout to swim freely in a continuous exchange of fresh water, similar to cows or sheep roaming a fenced field. Net pens have roughly 80% lower densities than tanks, providing more room to swim, reducing stress on fish. What about fish manure in the open net-pens? How do the added nutrient levels impact the aquatic environment? Net-pen sites are carefully selected to ensure adequate water flow through-and-beneath the pens. This helps to ensure optimal fish health, prevent fish manure from accumulating around the sites, and maximizes the positive effects of farms on surrounding ecosystems. All of Ontario’s net-pen farms are located within Lake Huron, which is widely recognized to be an oligotrophic body of water. This means that it has a low nutrient content, making it difficult for high numbers of fish, plants, and other organisms to survive. One of the main missing nutrients is phosphorous, which is vital for plant life to thrive at the bottom of the food web. According to a 2017 report from Environment and Climate Change Canada, low levels of phosphorous in Lake Huron have caused a continual decline in wild preyfish stocks since 1972. Although there is limited phosphorous added to Lake Huron from farmed fish manure, it has still shown to have a positive contribution to biodiversity in the lake. For example, a five-year study from the Department of Fisheries & Oceans in the province’s Experimental Lakes Area demonstrated that the added nutrients from net-pen farms caused wild lake trout to spawn three years earlier than they had previously, which doubled their population during the duration of the study. Another study from the Ontario Ministry of Natural Resources around five net-pen sites found that fish manure or stray feed had a negligible effect on the food web. Every net-pen farm in Ontario conducts water samples on a monthly basis to ensure their farms continuing to support healthy, sustainable ecosystems within Lake Huron. Why do you grow rainbow trout in net-pens instead of on land? Ontario rainbow trout farmers grow their fish in land-based aquaculture tanks and raceways for about 9 months. After that, mature rainbow trout can be moved to net-pens which offer a greater supply of water and more room as they continue growing to market size. Raising enough rainbow trout to meet market demands using land-based technologies would require more electrical power and square footage (because nets are typically much larger than tanks) than would be logistically and financially viable. Net-pens allow for a more sustainable production cycle, which can have a much lower environmental impact. How often do net pens fail and what happens when growing stock escape into the open water? Modern net pens are solidly constructed and failures are extremely rare. Fish farmers inspect pens daily to ensure their valuable stocks aren’t lost. In the very unlikely case that fish do escape, there are protocols in place to limit environmental impacts, recapture fish, and notify appropriate authorities. In the specific case of rainbow trout escapes, these trout don’t impact the environment because they’re a naturalized species that can’t harm other rainbow trout in the wild. If anything, an escape of farmed rainbow trout would only add to the abundance of the species for sport fishers. What do farmed rainbow trout eat? Though wild fish eat mostly smaller fish, only a small portion of the diet fed to farmed fish comes from wild capture fisheries. Because fish feed is the most expensive cost of running an aquaculture operation, for the health of the growing stock, and to minimize waste, farmers are always looking for the most efficient feed to provide the highest performance in the shortest amount of time. Farmers understand that less waste and better food conversion produces the most sustainable results. Farmed rainbow trout in Ontario typically eat feed that is less than 15% fishmeal, with the rest being comprised of plant and animal proteins, fats like fish and canola oil, grains like wheat, as well as a healthy mix of vitamins and minerals. Is fish feed bad for the environment? Unlike pet food, commercial aquafeed is formulated specifically for each species and life stage of a fish, with the highest quality ingredients, to ensure efficient and sustainable performance for food production in the open environment. Feed is made up of proteins, fats, carbohydrates and micronutrients like vitamins and minerals, with ingredients for feed constantly being refined and improved through dedicated research. Canadian aquafeed is regulated by CFIA and is held to food-grade standards for safety and nutrition. As an industry, which uses finite resources, the feed manufacturers Ontario uses are committed to sustainable feed production and the industry continues to see a reduction in fishmeal use. Of the fishmeal used, most comes from responsibly managed fisheries like those certified by the international Marine Ingredients Organization (IFFO). Currently the typical trout diet has less than 15% fishmeal. The feed manufacturers also provide onsite knowledge and training on feeding techniques to maximize fish growth and reduce feed waste. Farmers carefully manage the amount of feed given to fish so there is minimal waste, ensuring feed does not build up in the aquatic environment. Fish are extremely good at converting feed to growth resulting in one of the highest efficiency animal production systems in the world of farming. Do farmers add dye to make the fillets pink? While farmers do not dye their trout, a necessary pigment in the food just happens to be pink. This pigment, in both natural and synthetic form, is a potent antioxidant (astaxanthin) that is part of the fish’s natural diet, and can even be purchased in health food stores for human consumption. One byproduct of astaxanthin – which aids rainbow trout metabolism – is a change it causes in the pigmentation of flesh. How does rainbow trout net-pen aquaculture impact native fish populations? Rainbow trout net-pen aquaculture has shown no negative effects to native fish populations. In fact, recent studies are showing the opposite, with fish farms actually helping dwindling populations of native fish species to recover. For example, a five-year study from the Department of Fisheries & Oceans in the province’s Experimental Lakes Area demonstrated that the added nutrients from net-pen farms caused wild lake trout to spawn three years earlier than they had previously, which doubled their population during the duration of the study. Another study at the University of Guelph is underway to examine why there is increased biodiversity, meaning more fish, plants, and other organisms, around net-pen sites in Georgian Bay and the adjacent North Channel. Do rainbow trout farmed in Ontario face the same disease issues seen elsewhere in Canada and around the world? Unlike farmed fish in other parts of Canada, there has never been an instance of any major disease in populations of rainbow trout farmed in Ontario. To help ensure this continues, hatchery fish are checked for disease before they travel to open net-pens. All types of farms also conduct regular health screening and follow strict biosecurity protocols to ensure optimal fish health. Where do rainbow trout eggs come from? Rainbow trout have been bred in Ontario since 1953. Since then, most of the rainbow trout eggs used for fish farms in Ontario are spawned from breeding stocks within the province. If there are not enough local eggs to fill the demand, hatcheries will purchase eggs from suppliers in Washington state and are subject to stringent regulations that must be publicly reported to Fisheries and Oceans Canada. Are Ontario farm-raised trout genetically engineered or modified? No. Rainbow trout raised on farms in Ontario have never been genetically engineered or modified. Our farmers feel they are already producing a good quality, economically viable product. At this time, there is no interest in pursuing genetic modification of our fish. Stay tuned for FAQs on Ontario shrimp and other species! Didn’t see your question here? Send it to us at hello@ontarioseafoodfarmers.ca! Amount of rainbow trout that are grown through long-term partnerships with Indigenous communities. Ontario Aquaculture Association © 2018 / All rights reserved.